Down the street from my house in Portland, Oregon is Gabriel Park. I call it Gabe. I spend as much time as I can in that park whether I’m playing basketball or tennis, taking my dog for a walk or just walking through to get to the collection of quaint restaurants and stores called Multnomah Village. Throughout my many years of exploring I have seen grand douglas firs housing great horned owls, pinecone covered western hemlocks providing bugs for the ever drumming heads of the pileated woodpeckers and the many squeaking squirrels being chased up bigleaf maples by yapping dogs. In other word s, I consider this park to be a beautiful extension of my backyard. Apparently other people also feel the same way about Gabe and that’s part of the problem. Unlike me some people disregard respect for the wildlife in their backyards. Much like the grazing cattle of Hawaii they trample over saplings and unknowingly squish the various homes of native wildlife. 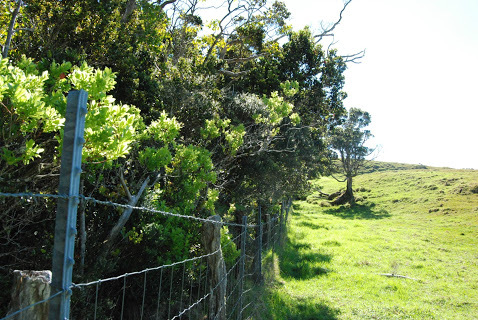 In Hawaii the one thing keeping cattle out of the native forests is usually a barbwire fence. When I went to Kohala Forest Reserve high up on the slopes of Kohala Mountain the consequence of letting agriculture take control was obvious. On one side of the fence is a inviting luscious green jungle with the quiet tweeting of various native honeycreepers. On the other side is short beige grass with the occasional stub of what used to be a bush or tree. In Gabriel Park the humans are not as effective as the cows but they still do a pretty good job at making the forest floor consist solely of fallen pine needles from the old trees above. About a decade ago,the local Parks and Recreation Department decided to erect fences around some of the more vulnerable areas in Gabe. The areas behind the fences started to regrow after a number of community plantings that I participated in. Then in the central forest a couple of signs fell and a few wood beams rot and broke. Now these once protective fences still remain in disrepair. The saplings are being trampled again and the homes of wildlife are being crushed. More recently, on one section of the park that I call Little Gabe, they put a chain link fence with signs up around a field on the edge of the forest. This meadow was converted to native grasses, wildflowers, and shrubs to provide habitat for butterflies, bees, birds and other pollinators. This area stayed respected and in good condition unlike the central forest of Gabe. I am going to organize a group of neighbors that share my interest in preserving the wild areas of the park. One initial action will be to continue the community plantings in places where they will have a chance to survive. 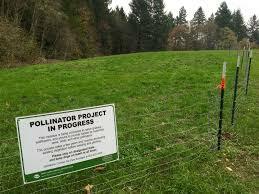 Some of the native planting options for Gabriel Park include: Western Trillium, Indian Pipe, Arrowleaf Balsamroot, Beaked Hazelnut, California Figwort, Black Hawthorn, Bitter Cherry and Bigleaf Maple. The next action will be to resurrect the fallen fences and signs around the forest. 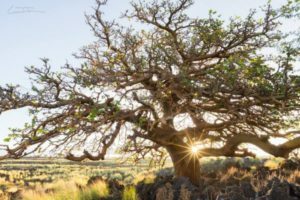 All of this can be done by taking some of the information I learned while volunteering at Waikoloa Dry Forest Preserve in Hawaii. It was once a canopy forest full of Wili Wili and Uhiuhi trees. 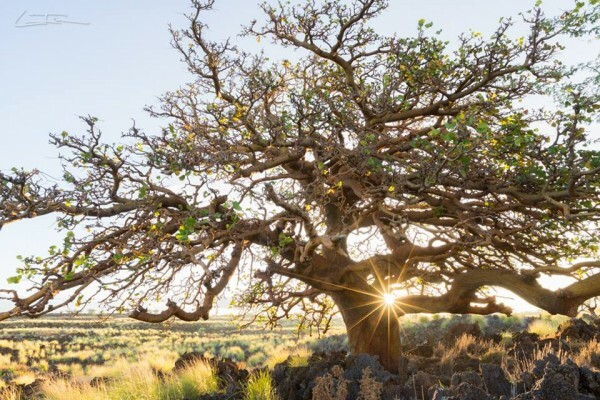 Currently it is home to eight of the seventy Uhiuhi trees left in the world scattered throughout its planes of lava rock. This preserve of over two hundred acres is independently run by only two people. A greenhouse is used to nurture saplings before they are put in the ground. They plant a native shrub that sheds its leaves quickly to create a top soil over the lava rock. Then they plant hundreds of native plants, water those plants and maintain fences around those plants throughout the preserve. I figure if they can do that across that vast rocky terrain my neighbors and I can take care of our local park and the wildlife that sings, pecks, squeaks and howls inside.